Review: “Berberian Sound Studio”, inspired on giallo (an Italian mystery genre), can’t be cataloged as a standard horror movie. I see it as a mere experiment on sound and image, without having much concern about the storyline or message to convey. The visual part was well crafted, with dim lights and different interesting shade plans of the actor Toby Jones, contributing to enhance the mystery of the story. The grotesque sounds worked well, but perhaps with an overuse of screams (there are for everyone’s tastes). The Italian language, often called romantic or sweet, has here a diabolical transformation, turning the atmosphere even more obscure. 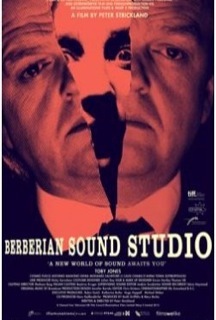 “Berberian Sound Studio”, despite of its unique conception and all the technical wonders that puts out, lacks emotion, leaving us in a state of suspension. I ended with the sensation that all the tense moments were inconsequent, making this story an inconclusive bad dream.